Above-average indie band and sandwich enthusiasts Two Door Cinema Club have just announced their biggest ever concert at the O2 Arena in London. And, to celebrate, they're releasing an EP with boy genius dance wizard Madeon. 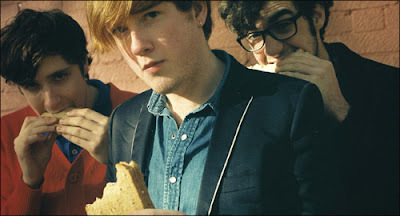 According to the BBC, they bribed him to do it with a hot dog (Produce the EP, that is. Less of your filth). The title track is called Changing of the Seasons and it was Huw Stephen's Hottest Record In The World last night. Apparently, the song is so fresh the record label don't have a copy, so they've had to put a radio rip on the band's official Soundcloud page. If you can endure Alex's tremulous falsetto in the first verse, the song really takes off around the 45 second mark.